How you fundraise is up to you. However you choose to fundraise, we want to hear from you. Tell us about your race night, dinner dance or garden party and we can share your success in the latest news. You can also join our social wall of fame by posting about your fundraising on Facebook, Instagram and Twitter. Sign up for our spook-tacular Halloween Pumpkin Hunt event taking place during the October half term! There were smiling faces, wagging tails and lots of clowning around when the Farnborough Fayre took place. Pedal power and team spirit helped a cycling club to win a shield. Children supported by Demelza have created their own #BabySharkChallenge video. Our Eltham hospice was pleased to welcome Charlton Athletic coach Johnnie Jackson who visited shortly after his birthday. 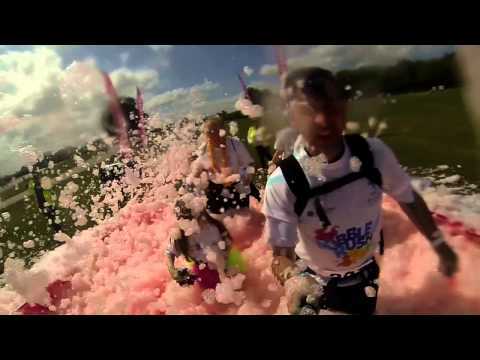 Hundreds of adults and children enjoyed a foamy fun filled family day out at Bubble Rush Kent. Over 400 people enjoyed sun, shade, music and tranquillity at an open garden event to raise money for Demelza. More than 40 cyclists took part in Ride London for Demelza and between them raised a staggering £15,502! Former Strictly Come Dancing judge Len Goodman recently took part in a fun golf day for Demelza. Demelza Hospice Care for Children is asking local MPs for their support for increased funding. Demelza Hospice Care for Children is appealing for volunteers to work in its new Tonbridge shop. Read about the fantastic Morrisons volunteers who have repainted and refurbished an outdoor play area. We give thanks to our remarkable volunteers like Valerie during Volunteers' Week and our 20th Anniversary month. HRH The Duchess of Cambridge has sent a message of support to celebrate and mark Children’s Hospice Week 2018. An anonymous millionaire is selling his Devon mansion to help raise funds for Demelza Hospice Care for Children. Giving your time makes care possible. People who give their time as volunteers ensure Demelza can maximise the funds donated by supporters to invest in vital care for seriously ill babies, children and young people. We're always in need of volunteers to lend a hand at our fundraising events and there are opportunities in many other exciting roles. Find out more.